New Zealand has thanked Israel for its aid in the wake of a crippling earthquake in Christchurch. Three Israelis are dead, three are still missing. New Zealand's government has thanked Home Front Protection Minister Matan Vilnai for aid sent by Israel this week. 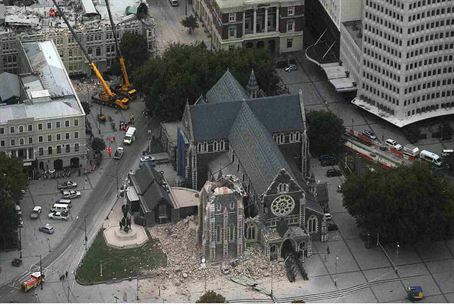 Vilnai arrived Wednesday in Christchurch, where a 6.3-magnitude earthquake that struck at midday last week has crippled the city. The minister flew to the island nation to help a delegation locate missing Israelis. At least three Israelis were confirmed dead in the tragedy. The bodies of Ofer Levi and Gabi Ingel, both 22 years old and from Rehovot, have been identified. The two were planning to work on a farm near Christchurch; their bodies were found in the rubble of a building in the city center. The body of 23-year-old Ofer Mizrahi of Kibbutz Magal was also found earlier in the week. Three others have yet to be found: Chen Ben-Hemo, Ro'i Vaknin and Shlomo Avitan, all of Dimona. In conversations with Bob Parker, mayor of Christchurch, John Carter, Minister of Civil Protection and Mary Kelly, Foreign Affairs Minister, Vilnai expressed Israel's condolences. “Israel joins you in your sorrow and will continue by your side for as long as necessary to help in dealing with the difficult consequences of the earthquake,” Vilnai said. He suggested to the ministers that New Zealand participate in Israel's national disaster emergency preparation exercises this coming June as a means of improving the readiness of both nations through joint learning. Vilnai also visited with Israeli rescue and recovery personnel, expressing the nation's pride in their efforts to identify victims of the earthquake. “You are the pride of Israel,” he told them.